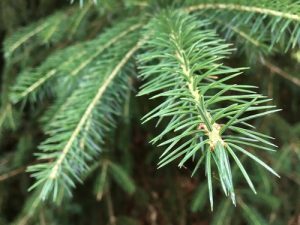 The Nordmann fir (abies nordmanniana) is one of the more exotic specimens offered among G&S Trees wide selection of landscaping trees for sale. This beautiful, robust species of evergreen originally hails from the mountain ranges to the South and East of the Black Sea. However, no tree is too exotic that Appalachian Farms can’t cultivate and make it available to discerning Christmas tree connoisseurs across the nation. Searching for Nordmann fir Christmas trees? Call us and we’ll ship one directly to you! The Nordmann fir is also known as the Caucasian fir due to it’s ancient origins in the Eastern Greater Caucasus. Due to the climate difference after the ice age, this tree is no longer found there but rather in Turkey, Georgia, the Russian Caucasus and parts of Armenia and Azerbaijan. This specimen is a veritable giant among other evergreen conifers as it has been recorded to reach heights of 279 feet tall with a trunk width to match. However, that amount of growth was achieved in the wilds of the Western Caucasus Reserve. Although it is the tallest species of tree in all the Caucasus, the Russian Federation, Anatolia and the entire continent of Europe, it is cultivated and cut in the states at around 6-9 feet to make for a rustic and sturdy Christmas tree. This tree is adorned with long, thin, elegant needles that are a glossy shade of dark emerald. They are not sharp, but rather blunt and gentle to the touch. The foliage is lush, abundant and isn’t going anywhere anytime soon! Because this particular fir is most popular for how, even after the tree dries out, the needles don’t drop off without a fight. Meaning you can have this stunning example of an evergreen on your Christmas hearth till Valentine’s day with minimal cleanup! Although this tree is ideal for many reasons, G&S Trees offers an array of landscaping and Christmas trees which are for sale year-round.